“F*** you, Tarzan.” COMICS! Sometimes ‘Tis Pity She’s A Whore! 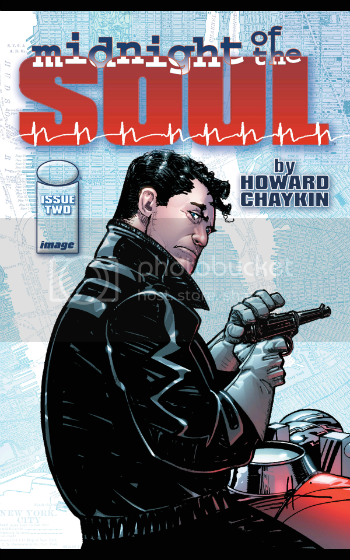 On one level ‘Midnight of the Soul’ is exactly the kind of comic everyone thinks Howard Victor Chaykin makes, but on another level it isn’t, and the abrasion between what you expect to read and what you actually read creates some smart sparks. I think. 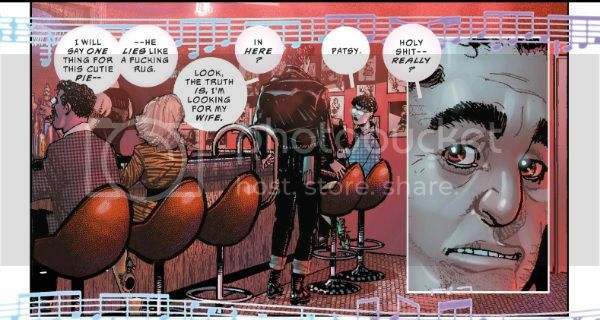 The success of Chaykin’s smuggling run in 'Midnight of the Soul' is aided no end by the fact he draws it and so, inevitably, it looks just like a Howard Victor Chaykin comic. 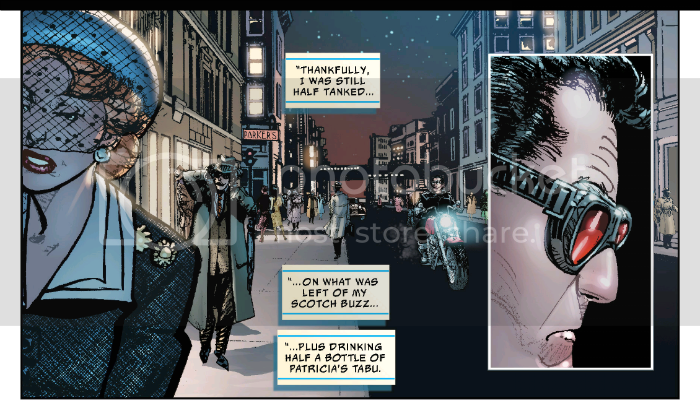 This is the bit that misleads because the surface is flawlessly “Chaykin”. Obviously. What did you want, Dave McKean? The guy’s in his sixties, he’s not likely to be suddenly incorporating mixed media and sculpture into his work. Not when “Diagnosis: Murder” is on and there’s kosher Franks in the pan! 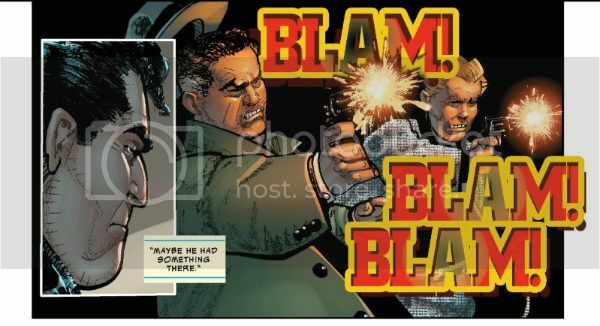 Thus, the art is as Late Chaykin as Late Chaykin gets. 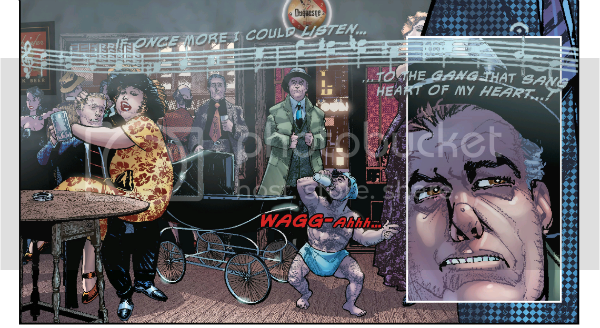 And, yes, it breaks my heart too, but it is getting late in the Seasons of The Chaykin. But dry your eyes, o feral child, because he’s still with us, and he’s still delivering his pugnaciously suave art. Sure, some eyes will still be perturbed by the clip art that doesn’t quite gel and flinch at the odd lapse in positioning. 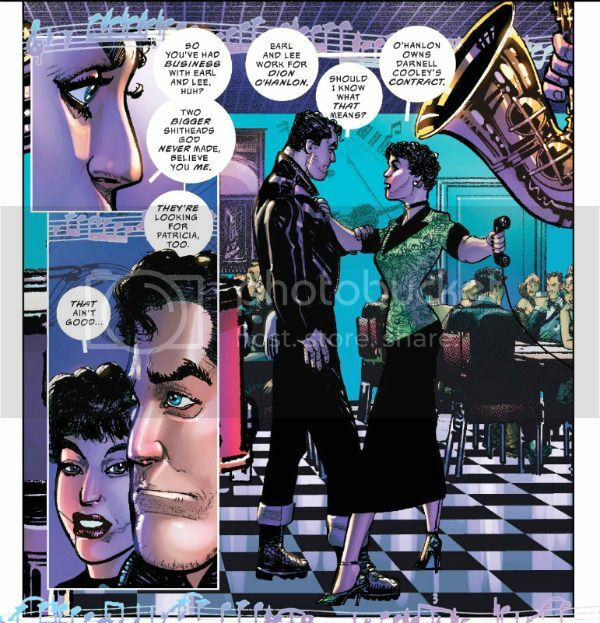 I’m a Chaykin maniac but I’m not blind to his transgressions; there’s one panel of Patricia in a doorway that doesn’t work – at all, and he’s stuck himself with a motorbike image that doesn’t always suit the angle of his composition, and that precise image of a woman was in Satellite Sam, and that cop’s all out of whack with that barrier and, and, and, you know, we could carp all day, but what matters is that for the most part, most of it works. As your eye sweeps over it, as you read it, it works. If you sit and look at each panel, eh, not so much. But who’d do that? Whaddya think comics are? Art? Comics are for reading first and looking at second. 'Midnight of the Soul' is a VERY GOOD! read. 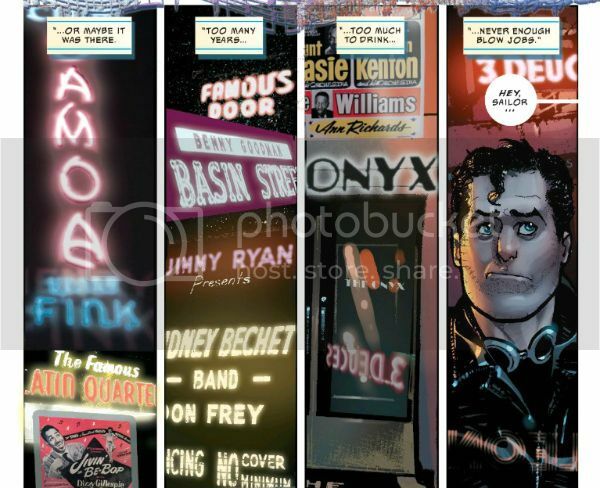 The occasional glaring visual infelicity aside, Chaykin definitely gets in a major artistic victory by resurrecting a sense of of New York as 'twas. While Arbutov’s colours remain a little too garishly lacquer-ish for my sedate tastes, they contribute enormously to this effect as well. The interiors of the dance halls and gin-joints are particularly noteworthy and Arbutov lays down some seriously hot pinks and cool greens. So, y’know, yay. The ‘50s being the Golden Age of The Billboard, omitting to mention the phantasmagoria of styles and fonts Bruzenak scatters as gloriously and as evocatively as the notes Gershwin throws over the opening of ‘Manhattan’(1979) would be a serious dereliction of duty. Bruzenak also subtly colour codes his speech bubbles so you know who is speaking even when they are “offscreen”. The big thing about Big Ken Bruzenak is that he never stands still (artistically, that is), and his stylistic evolution continues here with a pretty darn exciting and innovative mock 3-D lettering effect, used sparingly and effectively. 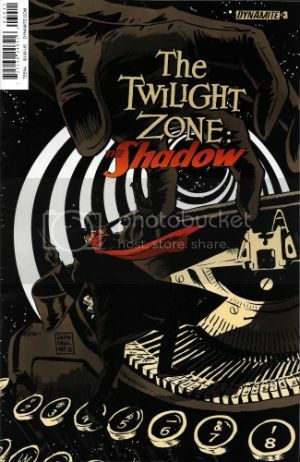 Conjuring a particular time and a particular place from the past into the present via paper and ink is a very Chaykin preoccupation. The man’s rightly proud that locations in the original ‘Black Kiss’ are so redolent of ‘80s Los Angeles that readers’ noses start convulsing for coke in sympathy. In ‘Midnight of The Soul’ Chaykin (and Arbutov and Bruzenak) work a similar feat for ‘50s New York, though here it’s your stomach that rumbles for coffee and a doughnut, rather than your nose for Class ‘A’s. Not that the New York of ‘Midnight of the Soul’ is drug free. Au contraire, mon frère! 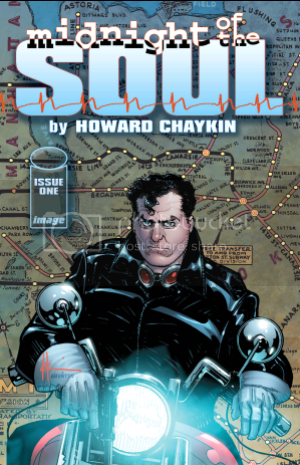 On past evidence Chaykin’s not one of those selective amnesiacs who thinks the past was a magical Eden, to which the present is a disgraceful relative. If anything he’s prone to wallowing in the seamier side of things, and we’re not just talking about stockings there. And so it goes that Joel Breakstone’s search for his errant wife brings him up against a rash of rascals, a pair of gun slinging gunsels (in the correct sense of "catamites"), a saucy whip-smart dancer, a corrupt cop, and a boss man with a ginger flattop. This is after all, the ‘Midnight of The Soul’, so a certain sense of threat and moral conflict come with the territory. I mean, I could be wrong, but I believe the title alludes to ‘The Dark Night of the Soul’ (AKA ‘Noche obscura del alma’). That’s not because I am an expert on the poetry of St. John of the Cross (1542-1591), but because ‘Midnight of the Soul’ has a familiar structure, one which accords with the ‘time of testing’ the poem assures us we must all go through before reaching a state of Grace. Something to look forward to there, kids. That’s some high falutin’ stuff, poncho! Don’t worry, it just means ‘Midnight of the Soul’ is a lot like, oh, ‘After Hours’ (1985). Basically in these things you get some dude (or maybe a lady these days) out of his depth flailing about a thoroughly threatening city, encountering threats embodying his inner failings, while his intended goal remains persistently out of reach until his ordeal has suitably shriven him for the final confrontation. After which he’s a lot more at peace than he was when he started. And so it is for our slightly schmucky and typically Chaykin-esque looking lead, Joel Breakstone. Joel’s a failed writer but a successful drunk who slouches despondently in the garage of a house he sold to his Brother-in-Law to clear debts accrued, pecking out unwanted alt-History tales of a World where Germany won WW2. If Joel punched himself every time he ate a bagel he couldn't be more obviously a self-hating Jew. He doesn’t hate himself because he's a Jew though, he hates himself for some unpleasantness which occurred during the liberation of a Concentration Camp in WW2. Something, as Joseph Heller famously had it, happened. Coming to terms with that memory is Joel's key to Grace, but to do it he'll have to navigate his 'Midnight of the Soul'. Meanwhile, just to underline his emasculation, his wife is out bringing home the bread working as a night-court stenographer. Except she isn't, as Joel finds out while pathetically creeping the house for booze. Turns out she's turning tricks. The lit match of his self-righteous indignation plops straight into the accumulated reservoir of self-hatred, and the resulting explosion of dumb machismo is sufficient to propel the cuckolded schmuck out into the city in search of vengeance. New York, however, has other ideas. 'Midnight of the Soul' is a picaresque adventure comic in which a man finds out a lot of the things he thought he knew about himself aren't true, and that the truth might hurt but not as much as living a lie does. Also: violence, jazz, profanity, blow jobs, snappy patter, racism, jokes and a man dressed as a baby in an Irish bar. 'Midnight of the Soul' has something for everyone! Except humourless drips. NEXT TIME: Take a guess, punchy. That's right - COMICS!!! 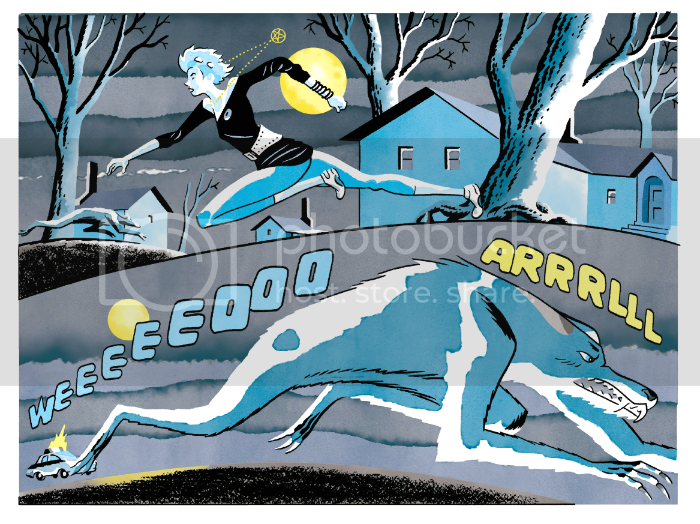 “...Even LIMP, That Bat's Too Much For ME.” COMICS! Sometimes It's The Cat Which is The Unnameable. What's not to love about that, am I right or am I right? 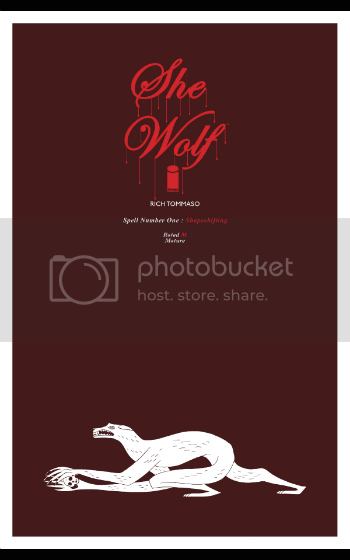 The slightly creepy theme (from my more than slightly creepy self) this week kicks off with Rich Tommaso's teenage werewolf comic. Pretty straightforward stuff you'd think, teenage werewolf comics; but you'd be wrong. Maybe. I mean she might be a werewolf, she might not, and if she is, well, she might have been bitten by one, or maybe a shape changing spell went wrong. Or she just doesn't like dogs and, uh, wait her boyfriend was a ...no, wait now she's fighting her priest but...maybe not. This hallucinatory narrative uncertainty is intentional, I would guess given that Tomasso's comic is a visually resplendent wonder indeed. You don't get the skill to draw something as phenomenally vital as this unless you know what you're doing. Of course, whether you want to let the reader in on what you are doing is another thing altogether. Standing in stark contrast to Alan Moore & Jacen Burrows reverent and stately paced dark hymn to the majesty of HP Lovecraft, here we have Van Lente & Vilanova's somewhat more modern take. Mash-ups are still modern right? 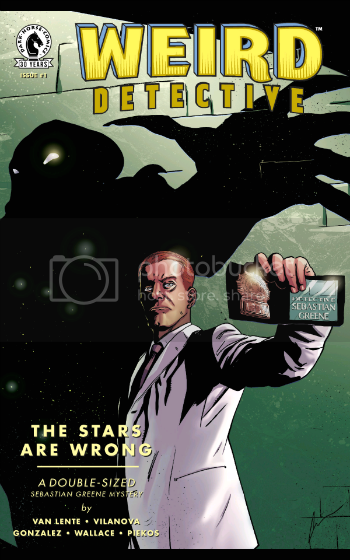 Because what WEIRD DETECTIVE ™ is is HP Lovecraft smushed up with the detective genre, hence the title. It's a lot of fun, whether it's more fun than PROVIDENCE I don't know, because anyone who measures fun is someone who isn't having any. Personally I had fun with both, just different kinds. WEIRD DETECTIVE is plump with cliches, but that's because the detective genre is filled with cliches rather than due to any lack on Van Lente's part. Van Lente in fact proves pretty smart at playing with the conventions and part of this smartness is displayed in his clever sense of humour. The scene where Greene watches TV detectives to get tips on behaviour almost buckles under all the referencing (Lovecraft, Rockford Files, Martian Manhunter, etc) but is instead impressive in both its levels of humour and intelligence. This undercurrent of drollery prevents things becoming too rote or too unpleasant. Because some of the book is pretty gross, there's the standout death by toilet but there are quieter horrors at play too. And all the horrors are derived from the Lovecraftian mythos and blatantly so. You won't be scratching your spade-like chin with this one trying to figure out the links, because the links come fast and blatant as Owen Smith's strings. I liked Vilanova's art, although it takes a dip near the middle of the book but swiftly recovers. His real world is realistic and his creatures are unpleasantly convincing. 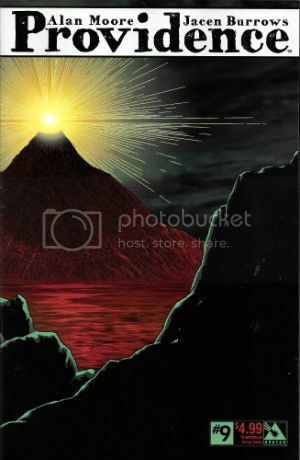 Let's face it, it takes no little talent to make unsettling some of Lovecraft's creations, which essentially resemble an overcooked carrot, some ping pong balls and a brace of drinking straws. The action is nicely done with a particularly good fall from a high place but Vilanova also keeps the quieter scenes interesting, such as the parts where our weird detective communicates with his cat through slight twitches of his facial muscles. Although any conversation with a surly cat is by definition interesting, I guess. WEIRD DETECTIVE is clever, funny, gross and GOOD! Lycanthropy and Lovecraft are creepy but the creepiest of all must be my fawning over the work of Howard Victor Chaykin. Occasionally some luckless naif will have the temerity to question why I like the work of Howard Victor Chaykin quite as much as I do. He, they often persist, always makes the same comic. This, and here is where their lucklessness comes in, spurs me to anecdotal reminiscence thusly: It was the 1990s and far too many people were taking Paul Weller seriously. One day I had a visitor who upon entering traversed the floor with the healthy, male clutter of batch (crispy tissues, ragged jazz mags, suffocated ashtrays, the glutinous residue of alcoholic frolics, etc etc) to the bookshelves. Despite the variety and fine taste on show said visitor was evidently puzzled, breaking their silence with, “You have an awful lot of Elmore Leonard here.” I conceded the truth in this observation, yet couched within my tone was my evident uncertainty as to why precisely that might be so remarkable. “But doesn't he just write the same book all the time?” came the withering parry. “Yes”, I said “but it's a good one.” Then I started searching for a vein. (Not really.) VERY GOOD! Remember: Stay on the road. Keep clear of the – COMICS!! !